Swachh Bharat Mission (Gramin), Assam. 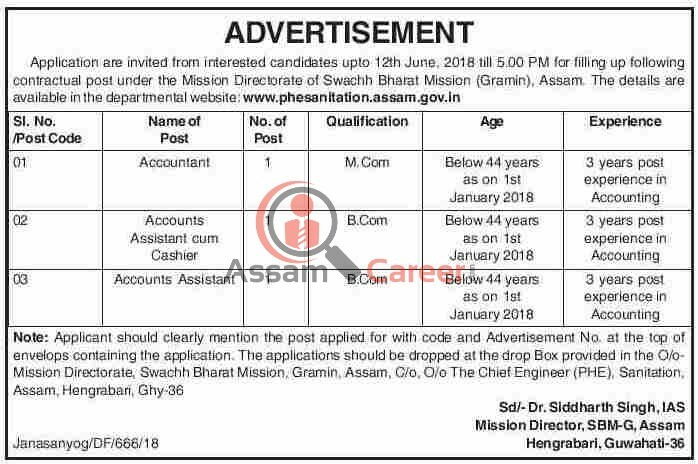 Application are invited from interested candidates upto 12th June, 2018 till 5.00 PM for filling up following contractual post under the Mission Directorate of Swachh Bharat Mission (Gramin), Assam. The details are available in the departmental website: www.phesanitation.assam.gov.in . How to apply: Applicant should clearly mention the post applied for with code and Advertisement No. at the top of envelops containing the application. The applications should be dropped at the drop Box provided in the O/o- Mission Directorate, Swachh Bharat Mission, Gramin, Assam, C/o, O/o The Chief Engineer (PHE), Sanitation, Assam, Hengrabari, Ghy-36.